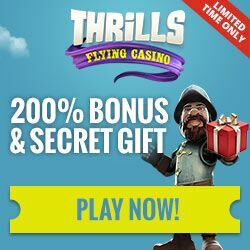 As usual, Thrills casino is going to offer its players an intense gaming action with lots of excellent promotions that are going to arrive on a daily basis. This online casino takes no breaks when it comes to promotions, always looking for more ways to encourage the members into a new set of bonus options to choose from. The month of February will not be left out without some great deals to intercept, involving the likes of which are sure to provide substantial resources to further increase much benefits. Follow Thrills during its ongoing calendar and you might just find whatever it takes to play and win, with a whole lot more than it can be achieved anywhere else. This campaign would be available until the 7th of February 2016, with is planned to be featured in the form of segmented offers that might be running for several days or apply just on a daily basis, so be sure to get ready for the incoming bonuses and after that, stay tuned for more that will appear at this unique online casino, as it always does. This would be a specific reactivation campaign that will reward the players with real cash during active cask-back returns. Most of the players will be applicable for the 25% up to £25 Cashback, while the more loyal members can expect to receive a 50% Cashback. 5th February (Friday): There will be 5 Free Spins on “Holmes & the Stolen Stones” plus a 50% up to €25 Reload Bonus for the regular players. The loyal customers may expect to receive higher amounts of such promotional resources. 6th February (Saturday): Players might get a 100% up to €10 Reload Bonus, while the more dedicated to the cause are going to play with an extended bonus amount. 7th February (Sunday): In regard to the previously successful campaigns, this day is devoted to the Lightning Multiplier. Expect to make a double progress during the Bonus-O-Metre race competition. Also, remember to open the additional treasure chests after winning some bonus rounds on games featured on this event.